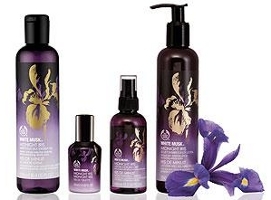 When The Body Shop launched White Musk Midnight Iris last month, I was intrigued — not because of the white musk, which isn't of much interest to me, but because of the iris, which is. So eventually I made my way to The Body Shop to try it. I'll start with the verdict: I was pleasantly surprised, but largely because my expectations were not especially high. When Angie reviewed the original White Musk, she noted that "someone wanting a sweet, warm musk could do a lot worse", but also that it was "compressed and dull" (although in all fairness I should point out that the latter comment was elicited by an on-skin comparison to Serge Lutens Clair de Musc, a considerably more expensive fragrance). That would be about my take on it too: nice enough, not terribly interesting. In this case, I'd say the flanker is at least more interesting than the original: White Musk Midnight Iris is warmer than White Musk, and not so squeaky clean. It has more oomph, and it wouldn't be so easily mistaken for a nice-smelling detergent. It starts with citrus and peppery-earthy iris, with noticeable clary sage (the full notes: bergamot, water lily, muguet, clary sage, iris, musk, sandalwood and tonka bean). If the iris stayed peppery-earthy longer than it does, I'd have bought several vats, but it fades to a more basic sweetish/powdery iris, only slightly earthy, over basic watery florals fairly quickly, and eventually it smells like the original White Musk smoothed over with a touch of iris. Then I don't love it quite so much. I did a version of Angie's comparison: I tried White Musk Iris next to Prada Infusion d'Iris and my recent favorite, Van Cleef & Arpels Bois d'Iris. A blind smell-test was not possible so perhaps I am kidding myself, but it seemed to me that anyone smelling the three would be immediately able to line them up in order of price: the White Musk Midnight Iris smelled clunky and obvious, like perfume-by-numbers, next to its two more expensive compadres. It made the Bois d'Iris smell even richer and more crazy-expensive than it is, and the Prada fell neatly in between. Still, it goes without saying that most people don't try perfume that way. For a budget fragrance, White Musk Midnight Iris is really nicely done, and while it may not work your average perfumista into a lather, it's worth a shot if you love iris and want a cheap thrill. It's hard to beat The Body Shop's prices. White Musk Midnight Iris is $17 for a 30 ml bottle of Eau de Toilette. The bottle is not fancy: the design you see in the images above is printed on a plastic outer sleeve, not on the glass, and because they've dispensed with (admittedly wasteful) boxes, there's an unattractive warning label printed right on the back. If you want something even cheaper, the 100 ml Chiffon Sheer Body Mist is only $15. I wish I'd taken a moment to sniff the Shower Gel ($250 ml for $15) or the Body Lotion (250 ml for $16) but I didn't think of it until later — if you've tried either, do comment. After reading, I was ready to say I’m going to run and check these out before I realized TBS decamped from Santa Barbara last year. Oh well. This sounds worth a try for a cheap thrill for another iris ho here. To be honest, the Prada does nothing for me and I’m basically giving mine away. The Different Company is the one I want vats of, and I’m afraid to try the VC&A. Yeah, stay away from the VCA! I’d still like several vats of the Chanel La Pausa too. And Robin, I’m with you on the vats of 28 La Pausa. It’s my favorite iris and I actually don’t find it “fleeting” like others do, more as low key and low sillagey (which are qualities I can value in a fragrance). I’m afraid I do find it fleeting — low key I don’t mind at all — but I want the vats anyway! Here! Here! TDC’s iris is irresistible. As for VCA…save yourself. I recently got a sample and now want to walk around with it glued to my nose like an oxygen tube. At least the TDC is cheaper! Wow! The TDC is pretty expensive itself. So far, I’ve just bought the little travel bottles of their iris. The TDC is my favorite of the more-or-less straight irises that I’ve tried. Iris Taizo is my favorite iris with a twist. Thanks for the review on The Body Shop offering! It is expensive, true! But the VCA is even more. Me too! I opened my sample of the VC&A Iris and it was hopeless, delirious love. I think I trampled several people in my haste to get into Harrods to buy it. I must sniff the TBS, as Robin says, the shower gel might be a tasty treat. Isn’t the VCA great? And if you do try the shower gel, please report back — I’m wishing now that I’d bought it. Any idea where the Van Cleef Collection perfumes would be available in Canada? Holt Renfrew only seems to have Feerie. I’m sorry but I really don’t know…hope someone else will chime in. I think I’m going to do a little visit of my local Body Shop soon! My go-to cheap iris thrill has been Yves Rocher iris Noir. I think it’s actually quite good. Have you tried it Robin? I was wondering how it compares to this Body Shop one. Iris Noir is more expensive than this one, and I’d say it smells like it…it’s a more complex scent. Haven’t smelled it in a few years so hope I remember correctly, but would say IN is fruitier, spicier, not quite as clean as WMMI. Wish I could remember which was darker, seems like it was probably IN. I see, thanks! Well since I love iris, I will give this a sniff. Why not – right? But I have a feeling my cheapie, but decent iris will still be the YR.
Any idea where i might be able to find the YR? It sounds tempting. You can order through the Yves Rocher USA website. The other day, they were offering a free-with-fragrance-purchase sample of the new Jasmine from the same line. I didn’t love the YR iris, although I really did like the rose in that series. They’re all well done though. Spooky! I’m wearing my YR Rose Absolue today, and I love it (but only when the autumn comes – it seems too sweet for hot weather). The Iris is lovely too, but sadly gives me a headache. However, it does smell surprisingly expensive, and I’m sure that Irisophiles who are feeling their credit cards need help would like it! Yes, they’re generally incredible bargains — very well done for the price. I still haven’t tried the new Jasmine! Don’t be too disappointed about the Jasmine – the only one I didn’t like (didn’t smell much like jasmine to me). Gave it away. Yeah, I haven’t heard many raves. The nice-smelling detergent description killed it for me. UGH! I detest detergenty scents. I haven’t had any luck with Body Shop scents. Oh well, there’s plenty of other scents out there. The iris doesn’t smell like detergent to me, just the regular White Musk one does. But you’re right: plenty more out there! I must admit that I am a fan of White Musk but I agree that it is overly clean – which is contradictory to its name as I associate the word ‘musk’ with ‘smelly dirty furry animal’. I had a sniff of White Musk Midnight Iris when it was launched in Adelaide, from the bottle not sprayed on my skin, and I didn’t like it. I will try it again this week to see if I can identify the iris. People who don’t like iris often describe it as “unwashed hair”, if that helps any! I own this one! I’d say it’s like the lighter fiction you read between the literature. Inoffensive, totally polite but not boring. I get quite a few compliments when I wear it. Not my favourite Iris by a long shot, but a lovely addition to your day-to-day library. Oh, and it doesn’t smell like its price tag, which always thrills me! Agree…it can’t stand up to the really top-notch iris scents, but it smells better than $17. The bottles look pretty in the pictures – until you find out they’re plastic. Might be a pretty look in glass and gilt for a more expensive scent. The perfume bottle, at least, is real glass. Covered with plastic, but still real glass! I’m really fond of the Santa Maria Novella Iris cologne. It stays with me all day (lasting power= a good EDT), and is a nice single-flower scent. I suppose the iris-crazy could layer it with other scents. I’m sorry to say that I can’t remember if I’ve tried it or not! I’d def give this a sniff. The Van Cleef is awesome! Really like it alot. Bk Prelude to Love I like too, but my Iris to die for is still SL Iris Silver Mist! I WILL own that one day! HA! True, nothing (so far) has beat ISM! i had on ISM yesterday, and believe me: this one will cling to you until your next shower, and it is GORGEOUS! the Santa Maria iris mentioned earlier has an extremely sweet dry-down on me, so that even though I did buy it i am now hesitant to wear it. Gonna score me a VC&A Bois d’iris next week.. hope it will live up to expectations though..
ISM is not universally loved…do let us know what you think! Just tried the Van Cleef Bois D’Iris. As a fellow Iris fanatic, I was enchanted immediately. What a brilliant accord, the iris, the spice, the woods – it took all my restraint not to buy it on the spot. Thank God I walked out with a spray on the wrist. Because later it settled into a long-lasting vanilla, leavened by spices of course, but no longer in the background to the iris. That was a dealbreaker for me. I know some of you loved the drydown, but I’m not a vanilla girl. What a close call, my $185 was safe.